The upcoming "Star Trek" game rekindles the show's voyage of exploration, but it's also a shoot-em-up title. Marc G. Millis headed NASA's Breakthrough Propulsion Physics Project and took an early retirement to continue this work as part of the interstellar research activities of the Tau Zero Foundation. He contributed this article to SPACE.com’s Expert Voices: Op-Ed & Insights. 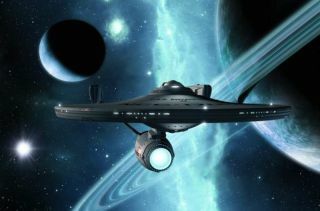 Another "Star Trek" film just hit the screen — featuring the venerable Starship Enterprise. To enable such fantastical star flight, we need faster-than-light (FTL) flight, control over inertial and gravitational forces, extreme energy prowess, and the societal discipline to harness that much power safely. Between the sensationalistic hype and pedantic disdain, how much progress is really being made? For starters, the technical goals ceased to be just science fiction decades ago with a legacy of pertinent publications (see editor's note below). To be clear, this does not mean that these breakthroughs are on the threshold of discovery. What it does mean is that these notions have advanced to where they are now problems that are able to be attacked. A graduate-level treatise, along with next-step research options, is available as the compilation "Frontiers of Propulsion Science" (AIAA, 2009). For the rest of us, here is a short version. Wormholes and warp drives— approaches to FTL flight — are theoretically possible, but the theory has not yet advanced to guide their construction. These theories are based on Einstein's theory of general relativity. The ongoing progress mostly focuses on the energy conditions — how to lower the energy required and how to create and apply the required "negative energy." One conclusion we have already found is that wormholes are more energy-efficient at creating FTL than warp drive. For more, see Eric Davis' “Faster-Than-Light Space Warps, Status and Next Steps” paper from last year's 48th AIAA/ASME/SAE/ASEE Joint Propulsion Conference & Exhibit. Recent news regarding the work of Harold "Sonny" White at NASA's Johnson Space Center has been exaggerated. That work is an attempt to measure space-time distortions caused by the presence of negative energy. Unfortunately, I do not have an article to cite about that hypothesis or the methods being used, since such information has not (yet?) been published. Although Eric Davis is tracking this for the Tau Zero Foundation, we do not yet know enough to render judgment. Quantum physics also presents tempting phenomena relevant to FTL questions. A number of phenomena, such as tunneling and entanglement, fall under the header of "quantum non-locality" — a term I learned from physicist John Cramer at the University of Washington, Seattle. Cramer's attempt to test the possible time-paradox implications of such phenomena still remains incomplete. The last update I saw was "Status of nonlocal quantum communication test" presented by Cramer and his colleagues. Given such an ability to create acceleration forces inside a spacecraft, it is not much of a leap of imagination to suggest that forces could be created outside a spacecraft too, thus moving the spacecraft through the universe. Such a nonrocket space drive would be a profound breakthrough. But wait, there's more. The physics of being able to manipulate gravitational and inertial forces also implies the ability to have "tractor beams" for moving distant objects, "shields" to deflect nearby objects, plus the ability to sense properties of space-time that we cannot yet even fathom. Researchers have published more than one way to generate such acceleration fields, and both methods are theoretically consistent with Einstein's general relativity (Robert Forward's 1963 paper cited below, and the Levi-Civita effect). Both of those have daunting theoretical and implementation challenges, similar to warp drives and wormholes. However, there is more than one way to approach this challenge, as I presented last year in “Space Drive Physics: Introduction & Next Steps" in the Journal of the British Interplanetary Society. That is the challenge that piques my professional interest. I'm revisiting the works of Eddington and Mach, to test a different formalism of the coupling between space-time (inertial frames) and electromagnetism that can be experimentally tested. Wish me luck. Interstellar flight — even when in the context of foreseeable technology — requires enormous amounts of energy, more prowess than humanity has yet achieved. On "Star Trek," they use matter-antimatter to provide energy (antimatter is existing physics), by fully converting matter into energy. Think Einstein's E=mc2. Our fantastical spacecraft will need at least that much energy, perhaps more. Nuclear power is a reality that, if used for spaceflight, would greatly increase the extent of space activities using foreseeable technology. The power levels required for FTL flight, values which were once astronomically high, have improved with continued research to where they are now just fantastically daunting. Other science fiction has cited quantum zero point energy as an ample energy source. Though quantum vacuum energy is rooted in credible theoretical and experimental approaches, that research is still too young to answer the wishes for ample energy conversion. Today, minuscule energy conversions are possible using tiny electrode gaps. Though these experiments are not energy extractors, they do serve as excellent tools to empirically explore this young topic in physics. An important element of "Star Trek" that went beyond technology is its society: creating a cooperative culture that can harness the power of starflight without killing themselves in the process. When considering the potency of the real energy levels required for starflight, that is critically important. This is not just a matter of inspiring fiction or feel-good notions. This is a matter of the survival of our species. Although trends indicate that humanity is becoming more peaceful, overall, I am concerned that this challenge might turn out to be harder than creating the new physics for FTL and controllable gravity. The good news is that this is something we can all work toward by being more thoughtful about how each of us chooses to resolve conflicts of views, wants and needs. If you want to become a practitioner in pursuit of "Star Trek"-style spaceflight, you will need an ample education in physics, a vivid imagination, steady rigor to work through the details and persevere through the setbacks, and the personal savvy to navigate amidst a world more interested in short-term returns, and sometimes even back to reruns. For those who want to support from the sidelines, the Tau Zero Foundation is now accepting memberships and donations. You can learn more about how to join the foundation here: http://www.tauzero.aero/. If, by some chance, you are a generous philanthropist reading this and wondering if Tau Zero has what it takes to run a whole program around this theme, the answer is “yes.” I led the NASA project toward such ambitions, including developing the process to sort through proposals to avoid the detriments of pedantic dismissals and the lunatic fringe. Those details are in the last chapter of our "Frontiers of Propulsion Science" book. We have a network of qualified practitioners who would gladly assist, even if only for a modest honoraria. And if you are a researcher hoping to find funds for this topic, please let us know if you find any. As yet, we do not have enough for ourselves, let alone to invite proposals. Help us continue exploring these highly speculative prospects today — prospects that might eventually escalate to fantastic starflight — enabling humanity to survive and thrive across the galaxy. A longer version of this article was originally published on Paul Gilster's Centauri Dreams: "Star Trek: Star Tech."